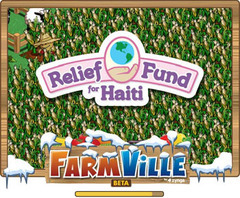 Facebook game Farmville has raised almost $1 million dollars for the relief fund in Haiti. Farmville players have been buying special White Corn through micro-payments of real money in the game, and 100% of the profits on this particular purchase go to the World Food Program. Farmville has been supporting relief work in Haiti since 1st October 09, when makers Zynga initiated a Sweet Seeds for Haiti charity built into the game. That campaign raised $1.2million over the three months it was running. It does throw the importance of games into the light again. I guess the good thing about Farmville’s campaign is that it makes people feel they’re buying something real and tangible with their donation money and I imagine that makes them more likely to donate. Apart from that Farmville has upwards of 69 million users, so even if each is just donating a few cents then the combined total still has the potential to be huge. I wonder if the charity sector could use games even more to get out messages they need to for less cost. Instead of say… posting out leaflets to thousands of households… they could buy space in a game like Farmville and maybe model an island, based on say Haiti, and combine real-time news and donation appeals modelled in a 3D virtual world. It would show you what’s going on plus improvements that are being made and let you make donations to specific areas. Would be a way of both getting news out about what’s going on where and also a way of getting donators more involved. To Buy White Corn for Haiti on Farmville visit the app here. Dunno if you have looked into the Fundraising in Second Life; you don’t need an island – set up a gig (I went to several for Comic Relief last year) and pick up a few lindens; set up a tip jar – most venues and shops are happy to ‘donate’ a prim! Of course the system is open to abuse – as any is. Not big into facebook myself – though I might get there!